of the women’s orchestra in Auschwitz. Kinderszenen (Scenes from Childhood), Opus 15, Number 7. The Terezín ghetto near Prague was home to a remarkable array of renowned Czech musicians, composers and theatrical artists, writing and performing as they and their fellow Jewish inmates awaited an unknown fate in Auschwitz. Video =Alice Herz Sommer, plays Chopin, survivor, deceased February 2014 age 110, music kept her spirit alive. 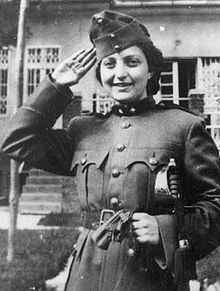 Hannah Szenes, 1921 –1944, Tortured & Murdered by Nazis, Poet, Hungarian-Israeli, War Hero wrote poem Eli, Eli (My God, My God) Music by David Zahavi.